In Release 11i, there are a number of GDFs that support the entry of information in the payment file about who should bear the cost of bank fees for a payment. Presently, this feature is used by the following countries: Austria, Belgium, Denmark, Finland, Germany, Netherlands, Norway, and Sweden. If you are not operating in these countries, you can disregard this section. The Japan Bank Charge feature implemented in Oracle Payables did not change in Release 12. In Release 11i, GDFs that hold bank-charge-bearer information are held at the supplier site. Denmark is the only country that has GDFs at the bank account level, which then defaults to invoices in both the invoice interface and the invoices tables. In Release 11i, there are a number of GDFs that support the entry of information about the bank where the disbursement bank account is held as well as payment instruction information specifying when and how the bank should transfer money to the supplier. Presently, this feature is used by the following countries: Finland, Germany, Netherlands, Sweden. If you are not operating in these countries, you can disregard this section. In Release 11i, some GDFs support the reporting of certain information to country governments or central banks. Presently, this feature is used by the following countries: Germany and Netherlands. If you are not operating in these countries, you can disregard this section. In Release 11i, GDFs that hold central bank reporting information and control fields, like thresholds, are held at the following levels: system payment format, supplier site, bank account, invoices (including invoice interface) and scheduled payments. The Netherlands also used two profile options, JENL: Reporting Threshold and JENL: Validate All Invoices. 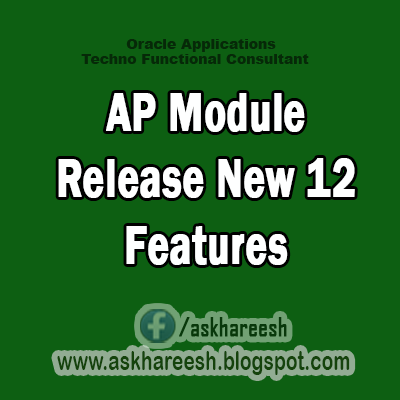 In Release 12, the following GDFs and profiles are obsolete and regulatory reporting is setup at the payment process profile level in Oracle Payments. Since this feature was redesigned with a fresh perspective based on requirements from all countries, no data will be upgraded from the GDFs. In Release 11i, there are a number of GDFs that support collecting of information pertaining to why a supplier or invoice is being paid. This information is required by government or central bank reporting. This feature is used by the following countries: Belgium, Denmark, Netherlands, Norway, Poland, and Sweden. If you are not operating in these countries, you can disregard this section. In Release 11i, GDFs that hold payment reason information are held at the following levels: system payment format, supplier site, bank account, and invoices (including invoice interface). In Release 12, the following GDFs are obsolete and payment reasons are collected at the payee level and defaulted to the invoice. Oracle Payments will not support a system level payment reason in Release 12. During the upgrade, existing values in the country-specific lookups for payment reasons will be migrated to Oracle Payments payment reasons and data in invoice GDFs will be migrated to the new columns on the invoice entities. In Release 11i, there are a number of Global Descriptive Flexfields (GDFs) that support entry of information assigned by a bank or third-party, payment system to the deploying company, also referred to as the first-party payer. The Global Descriptive Flexfields are used to capture this kind of information for implementations in the following countries: Finland, Germany, Netherlands, Norway, Sweden, Switzerland, and Denmark. If you are not operating in these countries, you can disregard this section. In Release 11i, GDFs that hold this payment file information are held at payment format level and at internal bank account level. You could enter payment format information in two places. The first, used for Germany, Netherlands, Norway, Sweden, and Switzerland, is the EFT System Information window, accessed from the main menu. The second, used by Finland, is a window accessed from the AP Payment Formats window, the Payment Format EFT Details window. Denmark is the only country that has GDFs at the bank account level. Switzerland: Company TELEKURS ID, Department TELEKURS ID, Company PTT File ID During the upgrade, Oracle Payments will create one Payment System record for each bank and a corresponding Payment System Account and its attributes for values formerly supported by the GDFs. Create the value as a bank instruction on the payment process profile in Oracle Payments. Not all GDFs will migrate to the new functionality in Oracle Payments. Invoice End Date will be obsolete in Release 12. Users can remove any message text once they do not want it included in the payment file. Amount Header will also become obsolete. The requirement for this field can be met using the EFT format template in Oracle Payments. Data will be migrated from the GDFs to the new fields on the invoice. Country- Specific validation for the reference numbers will be migrated into the validation module of Oracle Payments. Italy: "AP Payment: Company Details Printed" profile option. Netherlands: "JENL: Payment Specification" profile option. Oracle Payments provides an XML Publisher template for creating a remittance advice. You can modify this template to meet the requirements of your country. During the upgrade, Oracle Payments will migrate payment methods from the Oracle Payables entity to the new Oracle Payments payment methods entity and will upgrade all invoice data. Payments will also migrate default values for payment method, delivery channels and payment formats from the Global/Payables system, supplier, supplier sites and payee setups to the new Oracle Payments solution. The form that supports the specification of payment categories is obsolete in Release 12. The functionality that this form supported is partially migrated to new entities in Release 12. Part of the upgrade verification testing for electronic payment processing in Denmark should be to review the migrated data and configure new setup as needed. Each payment category is upgraded to a payment method in Oracle Payments. As noted in the previous section, the payment means and payment channel associated with the payment category are not upgraded. In Release 12, values for these should be set in the XML Publisher format template associated with the specific payment format. The seeded Danish format templates contain example mappings to help guide you in setting this information. During the upgrade information is migrated from the GDFs into the new columns.